Relative humidity is the relationship between the actual water vapor pressure and the maximum possible water vapor pressure. 100% RH corresponds to the maximum amount of water vapor a gas mixture can contain at constant pressure and constant temperature. At constant water vapor partial pressure and changing ambient temperature, the water vapor saturation pressure changes and consequently the relative humidity also changes (see water vapor saturation pressure). To obtain useful measurements of relative humidity, it is extremely important that the measurement probe and measured material have the same temperature. A hygroscopic material always tries to reach humidity equilibrium with the surrounding air. Equilibrium relative humidity is the free water content in a hygroscopic material after equilibrium is reached in an environment with constant relative humidity and temperature. Humidity equilibrium then prevails when the amount of water absorbed and given off is equal. Rotronic defines the response time of its sensors as the time taken to complete 63% of a step change in humidity levels. The response time becomes greater at low temperatures and low air movement. It also increases when a filter is used as the water vapor is transported through the filter more slowly due to the reduced air flow and the water exchange takes place with slower diffusion of the water molecules. The dew point is the temperature at which the air over water is saturated with water vapor at a constant air pressure. The water vapor pressure that then prevails is the same as the water vapor saturation pressure. This is the lowest temperature that can be reached by evaporative cooling. The water given off by a wet surface is then in equilibrium with the water absorption capacity of the surrounding atmosphere. To obtain useful measurements of relative humidity, it is extremely important that the measurement probe and measured material have the same temperature. The specific enthalpy of moist air is an energetic property. 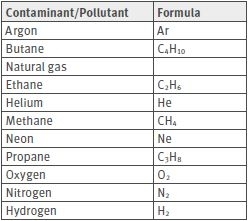 It is composed of the specific enthalpies of the components in the mixture (dry air, water vapor) and is related to the mass fraction of the dry air. It is given in J/kg. This is the ratio of the mass of the water vapor to the mass of the complete gas mixture containing the water vapor. This is the ratio of the mass of the water vapor to the volume of the complete gas mixture containing the water vapor. This is the ratio of the mass of the water vapor to the mass of the dry gas mixture containing the water vapor. This is the fraction of the total pressure of a gaseous mixture due to water vapor. This is the maximum pressure that water vapor can reach over a water surface at a given temperature. The mean kinetic temperature is the total influence of temperature on an object or product over a certain period of time. As a world-leading manufacturer of humidity measurement instruments, Rotronic is fully aware of its responsibility to offer instruments that can withstand the harshest operating conditions, while remaining user-friendly and requiring minimal maintenance. At the same time we urge our users to ensure excellent performance of the measurement instruments at the expense of little effort. The following checklist is provided as a guide. Analyze the environment in which the humidity probe is used. What suspended substances and/or chemicals exist and in what concentration? Install the probe at a place representative of the measured climate with good airflow across the sensor. Choose the right filter. Measurement is fastest without a filter. For wind velocities higher than 3 m/s, however, a filter must be used. The filter protects the sensor up to airflow velocities of 40 m/s. Suitable filters must also be used in the case of contaminants/pollutants and in harsh environmental conditions. Install the probe correctly to suit the application. For calibration, use one of our calibration services or the SCS-certified humidity standards. This will ensure your calibration is traceable to national standards. Inspect and replace the filter more frequently in harsh operating conditions. Filters can be cleaned in an ultrasonic bath. However, always keep a new filter set in stock. Check that the measurement probe is working correctly by performing a calibration at least every 6 to 12 months. A Pt100 sensor changes its electrical resistance with every change in temperature in its environment. Its resistance value is 100 Ohms at 0 °C. This characteristic is used in a bridge circuit to generate a signal suitable for further processing. There are five quality classes with the following tolerances at 0 °C. The table below illustrates the tolerances for each Pt100 sensor class at different temperatures. Example for Class B: At 200 °C deviations in the measured value of up to ± 1.3 K are allowed. 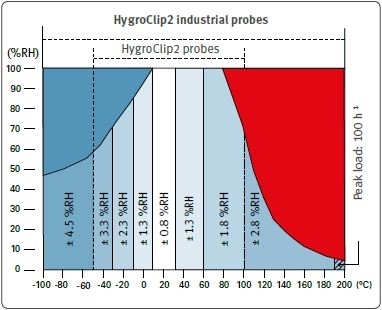 With its accuracy specification, Rotronic states the maximum permissible deviation of the HygroClip probe from the Rotronic SCS reference. The accuracy specification applies at the adjusted humidity and temperature values. 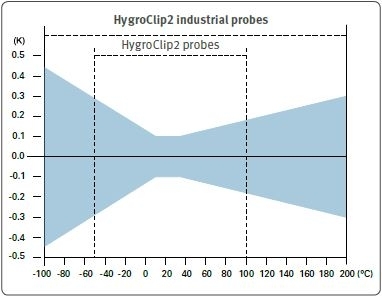 A validated and permanently monitored process guarantees that all HygroClip probes undergoing production match the Rotronic references used. In addition to this, samples are taken from every production batch and checked for accuracy against SCS references. Rotronic HC2A industrial probes are designed for continuous loads of up to 190 °C. Rotronic standard probes up to 100 °C. The peak load at 200 °C is 100 h. See the sensor data sheet for detailed information on the pollution loads for the sensor. Some gases and contaminants/pollutants can damage Rotronic humidity sensors. The contaminants/pollutants can be divided into two categories: gases without influence and gases with an influence on the humidity sensors. 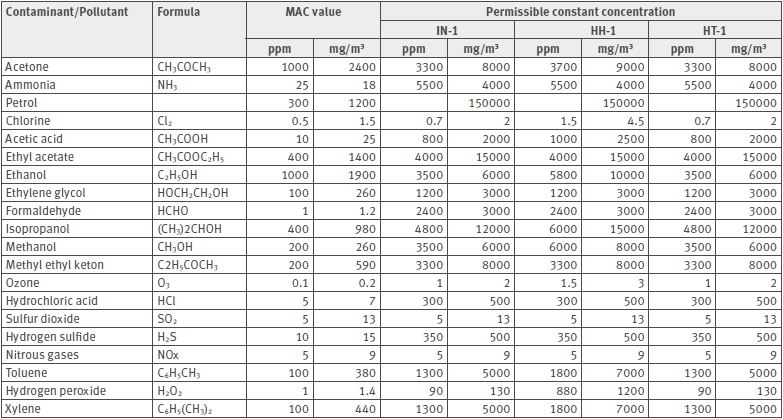 For contaminants/pollutants with an influence on the sensors and therefore with an influence on the measurement result, the maximum constant concentration must be known (see table below). Note that the common sealing material silicone damages the sensor! When probes are installed, silicone must not be used! What is relative humidity? ROTRONIC has been dealing for almost 50 years with the issue of relative humidity, during this time not only the know-how but also the know-what and know-why has steadily been growing. It is now time to pass on this knowledge piece by piece. The Humidity Academy that was setup by ROTRONIC USA is the way that we have chosen to share our knowledge. Starting with the first topic relating to the theory of relative humidity. We will work chapter through chapter bringing light into the dark or in our language humidity to the drought. Humidity is defined as some measure of the water vapor content of air (or other gas). The term 'humidity' is a general term to quantify the amount of water vapor in the gas. The term 'humidity' is often interchangeable with 'relative humidity', but there's a significant difference between these two terms in the context of precise measurement. This chapter explains why the difference between these two terms matters for people who are in the business of measuring water vapor in sensitive environments, and it covers the terms and definitions used to quantify the amount of water vapor in the gas. Water vapor plays a critical role in maintaining quality and efficacy for products that improve our daily lives – products we consumers trust are manufactured to specification. It is essential for manufacturers in a variety of industries to understand how accurate humidity measurements work, and the role your measurement instrument plays. Humidity is measured using a hygrometer, a tool that utilizes various materials and measurements to gauge a room or space's level of water vapor. While no scientific measurement is absolutely true, reaching humidity measurements that are as accurate as possible is crucial across industries. Since water vapor above certain levels can lead to condensation and eventually corrosion or mold, highly accurate humidity measurements are vital to preventing the degradation of everything from wooden construction materials, food products, pharmaceuticals, fuels, paper, electronic components and many other materials. Humidity measurements help maintain optimal environmental conditions for products and prevent costly damage to valuable goods. In this section, we'll uncover the basic laws of physics that govern relative humidity. Within a temperature range of -50 to 150°C and at pressures not in excess of 1000 kPa, water vapor practically behaves like an ideal gas. We'll use examples to illustrate the influence of temperature and pressure on relative humidity, and how to convert relative humidity into dew point and absolute humidity. First let's cover the basics with a review of the general properties of water vapor in a moist gas. When a water molecule leaves a surface and takes gas form, it has evaporated. Through the absorption or release of kinetic energy a water molecule transitions from the liquid state to the vapor state. Liquid water that becomes water vapor takes a parcel of heat with it in a process called evaporative cooling. Evaporative cooling is the reduction in air temperature resulting from the evaporation of a liquid, which removes heat from the surface from which evaporation takes place. The energy removed during evaporative cooling is known as 'latent heat.' Evaporative cooling is restricted by atmospheric conditions. The evaporation process consumes more heat when the air is very hot and dry, which makes the cooling effect more pronounced compared to evaporative cooling in hot and moist air. The conversion of water vapor to a liquid is called condensation. Water vapor will only condense on a surface when the surface is cooler than the dew point temperature or when the water vapor equilibrium in the air has been exceeded. When water vapor condenses on a surface, a net warming occurs. The water molecule releases heat, and in turn, the temperature of the atmosphere slightly rises. A 'Swamp Cooler' conditions air in hot weather through the evaporation of water. They work well in dry climates like Denver or Phoenix, but would not work well in Houston or Boston, where there is more moisture in the air. Many chemical reactions yield water as a product. If the reactions take place at temperatures higher than the dew point of the surrounding air, the water will be formed as vapor and increase the amount of water vapor in the gas. If they take place at temperatures lower than the dew point, condensation will occur, and water vapor will leave the gas. Other chemical reactions take place in the presence of water vapor, resulting in new chemicals forming, such as rust on iron or steel. Reviewing the laws of physics that govern water vapor in a moist gas can help you better understand the properties of what you're measuring. Understanding these properties will help you make a more accurate measurement and do your job more effectively, whether it's protecting a product from corrosion or maintaining a precise environment for storage or manufacturing. From pressure to temperature, the following ideal gas laws help us understand how humidity levels shift depending on the environment. At constant temperature, the product of the volume and pressure of a given amount of gas is a constant. The value of the constant depends on how much gas is in the volume. Standard Temperature and Pressure (STP) is set at a temperature of 0° C, 32° F and a pressure of 101.3 kPa at one atmosphere. At constant pressure, the volume of a given quantity of gas is proportional to absolute temperature (°K). Or at constant volume, the pressure of a given quantity of gas is proportional to absolute temperature. P= j x Tq is a proportionality constant that depends on the quantity of gas. j is a proportionality constant that depends on the particular sample of gas and its volume. To convert temperature in °C into absolute temperature in °K, add the constant 273.15.Dalton's Law of Partial PressuresThe total pressure of a mixture of gases is equal to the sum of the pressures that each gas would exert if it were present alone.Pt = P1+ P2+ P3+…P1, P2, etc., are the partial pressures of gases 1, 2, etc.Avogadro'sEqual volumes ofExample: one literThe temperatureHypothesisgases at the sameof any ideal gasof 0°C andtemperature andat a temp. of 0°Cpressure of 101.3pressure containand a pressurekPa is the standardequal numbers ofof 101.3 kPa,temperature andmolecules.contains 2.688 xpressure condition1022 molecules.or STP. It has been experimentally determined that the number of atoms in 12 grams of 12C is 6.022 x 1023. This number is called Avogadro's number. As one liter of gas at STP contains 2.688 x 1022 molecules (or atoms in the case of a mono atomic gas), it follows that a mole of gas (6.022 x 1023 molecules) occupies a volume of 22.4 l at STP. See definitions of mole and Avogadro's number below. The product of volume and pressure of a given amount of gas is proportional to absolute temperature. If Pt is the total pressure of a gas mixture and n1, n2, etc. the mole fractions of its components, it follows that: Pt= Pt x (n1+ n2 + …) and Pt= Pt x n1+ Pt x n2 + … where Pt x n1, Pt x n2, etc. are the partial pressures of components 1, 2, etc. The equation above is another form of Dalton's law. Water vapor is one of several gases that makes up air. For example if the total pressure of a system such as air at sea level is 1,013 kPa (or 29.9 inches of mercury), and that air is made up of Nitrogen, Oxygen, water vapor and other trace gases, each of those gases contributes to the total pressure of 1,013 kPa. The portion that is water vapor is called the partial pressure of water vapor. The partial pressure of water vapor is a key metric found as a component in the formulas that define all other humidity parameters. According to Dalton's law, the total pressure of a gas mixture is equal to the sum of the partial pressures of its components. This means that the partial pressure of a component is equal to the product of the total pressure times the mole fraction of the component. Therefore, a change in the total pressure of a gas mixture, at constant composition, results in the same change in the partial pressure of each component. For instance, doubling the total pressure of a gas mixture results in doubling the partial pressure of each component. As the total pressure increases, the partial pressure of water vapor increases proportionately. This is an important fact to understand, as you will see when we define relative humidity and dew point temperature. An increase in the pressure of a closed system will increase the relative humidity and raise the dew point temperature until saturation is achieved. phase increases: more molecules strike the surface of the liquid. When these two processes become equal, the number of particles and, therefore, the pressure in the vapor phase, becomes stabilized.The value of the equilibrium vapor pressure depends on the attractive forces between particles of the liquid and on the temperature of the liquid. Vapor pressure above a liquid increases with increasing temperature. The vapor pressure of water increases strongly with increasing temperature. When water freezes, the molecules assume a structure that permits the maximum number of hydrogen-bonding interactions between molecules. Because this structure has large hexagonal holes, ice is more open and less dense than liquid water. As hydrogen bonding is stronger in ice than in liquid water, the inter-molecular attraction forces are the strongest in ice. That's why vapor pressure above ice is less than the vapor pressure above liquid water. The vapor concentration or absolute humidity of a mixture of water vapor and dry air is defined as the ratio of the mass of water vapor Mw to the volume V occupied by the mixture. Dv = Mw / V expressed in grams/m3 or in grains/cu ft //The value of Dv can be derived as follows from the equation PV = nRT // Mw = nw x mw where // nw = number of moles of water vapor present in the volume V // mw = molecular mass of water // Dv = Mw / V = nw x mv / V = mw x p / RT where // mw = 18.016 gram // p = partial pressure of water vapor [Pa] // R = 8.31436 Pa x m3 / K x mole // T = temperature of the gas mixture in K // Dv = p / 0.4615 x T [g / m3] // 1 gr (grain) = 0.0648 g (gram) // 1 cu ft = 0.0283168 m3 // Dv [gr / cu ft] = 0.437 x Dv [g / m3]. Relative humidity is the ratio of two pressures: %RH = 100 x p/ps where p is the actual partial pressure of the water vapor present in the ambient and ps the saturation pressure of water at the temperature of the ambient. Relative humidity sensors are usually calibrated at normal room temperature (well above freezing). Consequently, it is generally accepted that this type of sensor indicates relative humidity with respect to water at all temperatures (including below freezing). As already noted, ice produces a lower vapor pressure than liquid water. Therefore, when ice is present, saturation occurs at a relative humidity of less than 100%. For instance, a humidity reading of 75% RH at a temperature of -30°C, corresponds to saturation above ice. The dew point temperature of moist air at temperature T, pressure Pb and mixing ratio r is the temperature to which the air must be cooled in order to be saturated with respect to water (liquid). The frost point temperature of moist air at temperature T, pressure Pb and mixing ratio r is the temperature to which the air must be cooled in order to be saturated with respect to ice. The wet bulb temperature of moist air at pressure Pb, temperature T and mixing ratio r is the temperature that the air assumes when water is introduced gradually by infinitesimal amounts at the current temperature and evaporated into the air by an adiabatic process at constant pressure until saturation is reached. The partial pressure of vapor is equal to the saturation pressure and its value depends only on temperature. There is no difference between the situation in an open environment and that in a closed container. In an open space, the volume V occupied by vapor is free to expand. Therefore, the partial pressure p is not affected by temperature. The partial pressure p can vary only if n varies (vapor is being added or removed) or if the total pressure varies (Dalton's law of partial pressures). For instance, total pressure drops with increasing altitude, which results in a decrease of the partial pressure of vapor. In a closed container of fixed volume, vapor occupies the entire volume of the container and this volume is constant. The partial pressure of water vapor(p) can vary only if there is a change in absolute temperature (degrees K) or a change in the amount of water vapor p. The partial pressure p does not vary with a change in total pressure unless the total pressure change is due to a change in the partial pressure of water vapor p.
Saturation vapor pressure depends only on temperature. There is no effect of total pressure, and there is no difference between the situation in an open space and that in a closed container.In an open space, at constant moisture level and temperature, %RH is directly proportional to the total pressure. However, the value of %RH is limited to 100% as p cannot be greater than ps.In a closed container of fixed volume, %RH decreases as temperature increases, but not quite as strongly as in open space. WIf the temperature of a mirror is lowered to precisely the value that makes dew appear on the surface, the value of the mirror temperature is called dew point. Using the previous example, the dew point corresponding to a condition of 50 %RH and 25°C can be found as follows:ps at 25°C = 3.17 kPa // p = 0.5 x 3.17 kPa = 1.585 kPa, corresponding to 50 % RH. If there is equilibrium between the dew on the mirror and the environment, it follows that ps at the temperature of the chilled mirror must be equal to the vapor pressure p. Based on a simple interpolation of the values of the saturation vapor tables, we find that a value of psof 1.585 kPa corresponds to a temperature of 13.8°C. This temperature is the dew point.The example above shows that converting relative humidity into dew point and vice versa requires the use of a thermometer and saturation vapor tables. If the total pressure inside a closed chamber is increased from one to one and a half atmospheres and temperature is kept constant, the partial pressure of water vapor is increased 1.5 times. Because temperature is the same, so is the saturation pressure ps. If we assume that we had a condition of 50% RH and 25°C before the compression, the condition afterwards is 75 %RH and 25°C. If dry nitrogen is injected in a closed chamber where there is already air at a condition of 50 %RH and temperature is kept constant, total pressure in the chamber increases. However, the partial water vapor pressure p remains constant because the mole fraction of water vapor in the chamber decreases by an amount that exactly balances the increase in total pressure (see Dalton's law). Because temperature is maintained constant, the saturation vapor pressure ps is also unchanged. Therefore, relative humidity stays at 50%, despite the fact that a dry gas was injected in the chamber. As the temperature of a system increases, the relative humidity will decrease because ps will increase while p stays the same. Likewise, as the temperature of a system decreases, the relative humidity will increase because ps will decrease while p stays the same. As the temperature is decreased, the system will eventually reach saturation where p = ps and the air temperature = the dew point temperature. As the total pressure of a system decreases, the relative humidity will decrease because p will decrease but ps will not change because the temperature has not changed. Likewise, as the total pressure of a system increases, the relative humidity will increase until eventually saturation is reached.